Do you suffer from headaches? Please know you are NOT alone and there ARE ways to help alleviate the pain. Headaches are one of the most common medical complaints, with most people experiencing one at some point in their life. A headache is your body’s way of signaling you that something is not right. 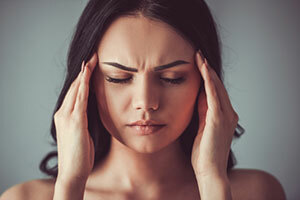 A headache can be a sign of stress or emotional distress, or it can result from a medical disorder, such as a migraine, high blood pressure, anxiety, or depression. There are two types of headaches: primary and secondary. Primary headaches are most common and are caused by overactivity of or problems with pain-sensitive structures in your head. Secondary headaches, not so common and sometimes more serious, are a symptom of a disease that can activate the pain-sensitive nerves of the head. Relaxation methods – meditation, deep breathing exercises, and yoga can help improve oxygen supply to the body including the head, can help lift the mood, and calm the mind at the same time. Stretching – try stretches such as neck range motion, shoulder shrugs, and neck isometrics. Doing these stretching moves two times daily for about twenty minutes per session can help with relieving the headache. Ice your forehead – a cold compress can help by constricting blood vessels, so they shrink and stop pressing on sensitive nerves and reduce inflammation. Get a massage – one of the oldest remedies known to be effective for seeking relief from headaches. Chiropractic care – works by correcting the mechanical dysfunction of the vertebrae of the neck and improving the alignment of the bones in the neck. This helps in relieving the pressure and irritation which causes headaches. These misalignments and dysfunction in the bone structure could be a result of an accident and injury, causing throbbing headaches and migraines, and can be corrected by a chiropractor. Headaches, caused by stress, strain, and tension in addition to misalignment caused by several hours spend bent down on a laptop, can also be corrected by a chiropractor by applying a sudden, and yet controlled pressure on the affected muscles. A 2014 report in the Journal of Manipulative and Physiological Therapeutics (JMPT) found that interventions commonly used in chiropractic care improved outcomes for the treatment of acute and chronic neck pain and the increased benefit was shown in several instances where a multimodal approach to neck pain had been used. Also, a 2011 JMPT study found that chiropractic care, including spinal manipulation, improves migraine and cervicogenic headaches.